Like a rolling lump of peanut butter – Where Is My Teaspoon? IT IS NEARLY CHRISTMAS! This has given me the boost to try and invest more time into my blog and into my kitchen. Since starting this blog, I have moved house 4 times which means that I’m back to using basic kitchen equipment again, disaster. 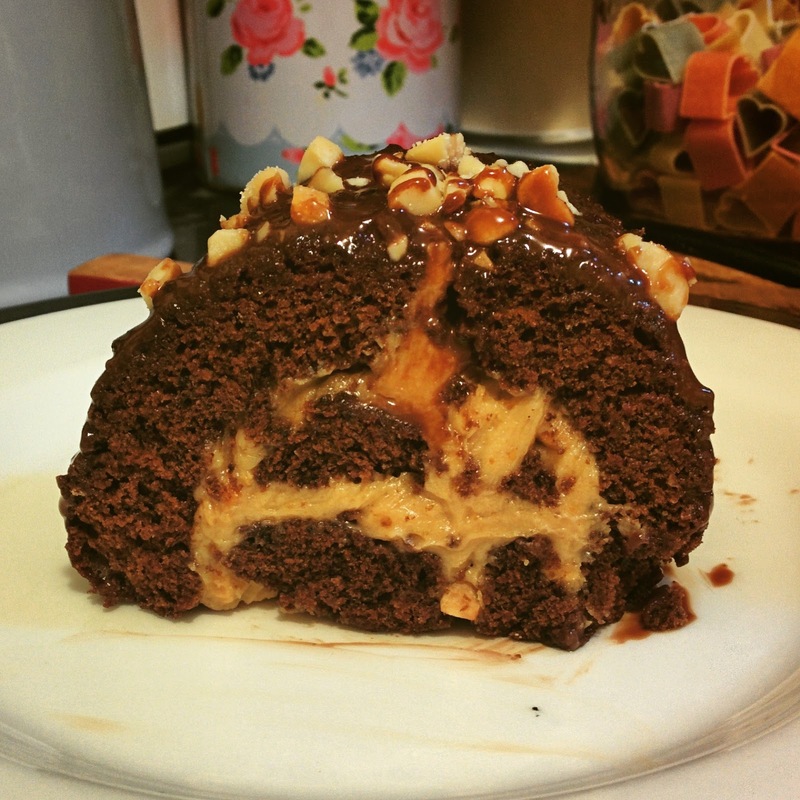 Still, last night I managed to make this Chocolate and Peanut Butter Swiss Roll. We were having some friends over for a board game night so I needed something I could make quickly, without much effort. We’ve made a Swiss Roll on the blog before, so this is basically the exact same thing again but just with new flavours. In a small bowl, weigh the flour and cocoa powder and mix together. Have a sieve ready beside this. Weigh out your sugar and add your four eggs in. Get an electric mixer and beat the sugar and eggs for at least 5 minutes. This seems a long time but you need to get as much air into the mixture as possible. It should be light and fully and if you make an 8 shape in the mixture, it should hold for a few seconds before disappearing. If you rush this, your cake won’t come out light and fully but rather rubbery..not good! Leave your electric mixer to one side. Grab a spatula and slowly sieve in your cocoa/flour mixture. Now, gently fold this into your egg mixture. Be quick but do not beat. If you were to just mix this, you would take out all the air you got in using your electric mixer. The goal of folding is to incorporate the dry ingredients evenly while keeping the air in. I really like making Swiss Rolls as they have a special sound when you’re folding in the flour. It’s almost like having a lot of bubbles in your bath. When you’re happy and can’t see any remaining flour lumps, gently pour your mixture into the cake tin. I hold my bowl as close to the tin as possible – do not let any air out, be gently. Now it’s in your tin, gently tilt your tin left and right to spread the mixture into the corners. Again, we want to keep the air in so don’t spread it with a spatula. Just let it gently roll down the tin. Pop it in your oven for anything between 7-10 minutes. The cake should bounce back when pressed. My new oven has a mind of its own so I only baked mine for 7. My mam bought me an in oven temperature gage which I’ve been using..but it just shows me how crazy my oven is! Definitely recommend getting one as it shows you the real temperature inside. While your cake is baking, you need to prepare to roll it. Clear some counter space and rub a wet cloth on it, this will help your baking paper to stick. Cut a sheet of baking paper and place down on the damp counter. Sprinkle caster sugar on the sheet – do put a good bit, this will stop your cake from sticking. Straight after your cake comes out of the oven, tip it out face down onto your baking paper. Cut a slit one inch from the end but make sure not to cut all the way through. Quickly, fold the cake into a roll within the baking paper. The baking paper should be rolled inside the cake. Fold it tightly and quickly and then leave it rolled like this to cool on a wire tray. As your cake cools, make your filling. Firstly, whip half of your double cream until firm. Then, mix this with your peanut butter to create a simple creamy filling. Put to one side. The chocolate topping is a simple ganache which we have done time and time again. Gently warm the rest of your cream. Add your chocolate in pieces and allow to melt off the heat of your hob. Mix gently. Allow to cool and thicken slightly. Put your salted peanuts out on a chopping board and roughly chop them to make a salty topping for your cake. If you are afraid that this will be too salty, add some caster sugar as you chop and mix them about. Now your cake has cooled, unroll it and spread your peanut butter cream across all of it. Begin to roll it up again by folding that same slit you made earlier. If you pull on your baking paper it should help you roll it up again. Don’t worry if it slits..it takes practice! Anyway, we are covering this cake with a chocolate sauce so no one should really notice. Previous Post Sometimes I wake up early..